Glimmers of His Plan Beginning to Form a Stained-Glass Window Through the Name Joshua! Well, a few days after Joshua’s arrival, Susie wrote to tell me about a basket that had been delivered to Betsy and Joshua while in the hospital from an organization called “Basket of Hope.” She described in detail all of the wonderful things the basket and held and wondered if I had ever heard of it. I had never heard of this organization, so I went to their website to learn more about this amazing ministry. At the time, Nick was very sick. I wanted so badly to see this ministry at the hospital in Columbus, but I truly didn’t have the emotional or physical energy to do anything at the time. But I wrote to Angela, the director, to ask for information for the future and received a large notebook, DVD, and brochures which I went through thoroughly, hoping someday to help this ministry make its way to Columbus Children’s Hospital. Within the same week that I talked with Angela, one of the wide receivers from the Detroit Lions (Mike Furrey) and his wife also spoke with her about beginning this ministry in…..
Columbus Children’s Hospital!!! Mike and Koren Furrey’s hometown is Columbus!!! hoping to connect us, and one evening Mike and Koren sat down and went through Nick’s site page by page. Mike fell in love with Nick. And the most amazing part is that Mike and Nick shared the same favorite memory verse! Since that day, we have become such great friends with Mike and Koren!! In December of 2007, we traveled to Detroit to watch the Lions play the day after Christmas!! And honestly, if you asked Mike today, he would say the same thing! Mike, I know that you are in a “waiting time” right now. Waiting to see which team you will go to next. And I know that you are praying fervently that God will lead your family to exactly where you are suppose to be. I can’t help but think that Nick is cheering you on from above and reminding you of your and his favorite verse!! Be strong and courageous! Do not be terrified or discouraged!! God is with you!!!! The look on Nick’s face was priceless as he watched a video from Mike and Koren saying how sorry they were that they couldn’t make it to the event…..
and then to see Mike come through the back door of the sanctuary and walk straight to Nick wearing his “Nick Nischan Day” t-shirt!!!! Wow! 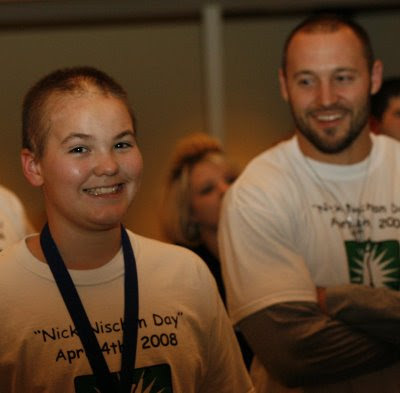 Mike then spoke to the several hundred people in attendance and shared his testimony and what Nick meant to him. Mike, we love you and Koren so much!!! You have shown a simple mom that there truly is love and purpose to the NFL that supercedes all fame and fortune and statistics!!! You have made me love football in a way I never did before!!! Thank you!! You truly have earned the name…. A WIDE RECEIVER WHO GIVES!!!! We were suppose to go to Detroit again on Thanksgiving Day of this past year……. The Lions were playing the Titans (Nick’s favorite team! ), but we had to cancel our plans because Nick was so weak….little did we know that that would be the last football game Nick would ever get to watch while on this earth. It was almost as if Nick knew this was the last thing he really cared to be a part of on this planet. He pushed himself physically to watch the whole game. However, within an hour of it being over, Nick fell to sleep and never woke up again. He passed away just a day and a half later. Just typing this is so hard for me. We miss him so much. So much has happened in the past two and half years. Betsy and Frank live everyday with two beautiful special needs children….smiling through every high and every low. 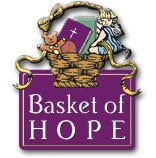 Mike and Koren have started a branch of Basket of Hope in Columbus, Ohio. Alicia, Koren’s sister, is the director, and their program is doing great!!! 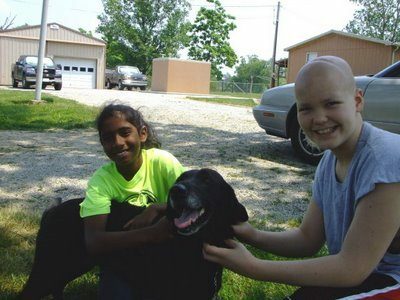 We began the Nicholas Yancy Nischan Foundation immediately after losing our precious Nick. We are partnering with the Mike Furrey Foundation! And we are starting an entirely new branch of Basket of Hope in Kentucky!!!! Angela, the executive director, is coming to our little town in Grayson in April to help us assemble our first 100 baskets!!! This is me and a group of wonderful people from our community who have come together from many different churches and organizations to start the new branch of…..
God is working………..even when things might not make sense at the time. Trust Him. Live for Him in spite of the pain. Eventually those little glimmers of something more beautiful will begin to sparkle in the corner of your eyes even if the glimmer is still in your tears. I remember realizing immediately after Nick died that the after-school routine was going to be one of the hardest parts of the day for us to get through. Nick was homeschooled this year, so when Todd and Olivia walked through the door every afternoon, Nick was always so glad to have them home. The action was back in the house and he loved hearing about Todd and Olivia’s days! Olivia would tell him things that had happened, and he was such a good listener. He kind-of lived life through her school experiences especially and it was just so sweet to watch! His chair was empty. Olivia and Todd came in to a dark TV that had once been filled with either the NFL channel or a cartoon. Todd went to the computer as soon as he walked through the door and Olivia seemed to be lost in the house for weeks. I should have known that God was working all things out in His time….He had begun working even before Nick went Home. For some reason (now I understand why) early last fall, Olivia became infatuated with pigs! We thought it was so funny and we really didn’t know why it had happened, but she wanted pigs in her bedroom, pig stuffed animals, pictures of pigs, any kind of pig she could get her hands on……she just loved pigs!!! After Nick died, her love for pigs continued! And then one day the most wonderful thing happened! So now, our Olivia has the TV set to tape this show every morning. And after school guess what we do!?!?! We watch Olivia the Pig…………………..on Nick!! It’s great! For the entire show “Nick” is on the screen in the corner……He’s right there with us getting us through the toughest part of the day!! And it’s the cutest show! It has given us so many laughs!! Oh, thank you, God, for working even through a cartoon to give a little girl just what she needed when she misses her brother so much!!! A show about a pig with her name and the funny adventures of her and her pig brother!! On a channel named after her very own brother!! 9Therefore God exalted him to the highest place and gave him the name that is above every name, 10that at the name of Jesus every knee should bow, in heaven and on earth and under the earth, 11and every tongue confess that Jesus Christ is Lord, to the glory of God the Father. I came home from subbing-HIGH SCHOOL!- and was so emotionally drained! Don’t get me wrong, I LOVE kids! I just get so burdened by their stories, their behavior, their lack of motivation……not all of them, but enough to really get me on my knees. Just minutes after walking in the door, our oldest son Erich showed up from college for help in getting his letters ready to send out about his summer medical mission trip to Kenya, Africa-I forgot he was coming! One of my dear friends came by to help with some work on Nick’s foundation. So much is moving along so quickly! We are thankful and overwhelmed at the same time! One of Olivia’s friends came home from school with her because her mom had a doctor’s appointment and for some reason they decided to see what would happen if they mixed things together like a frozen banana, baking soda, vinegar, dishwasher detergent, spices……..and just late tonight I learned that bleach was also involved! YIKES! Olivia! You just can’t mix some things……..it is dangerous! I haven’t even looked outside to see what they left on the picnic table-why do I just know it will sit patiently til tomorrow?! Todd had tennis practice so I had to work in running him back to the school. Tim had an elder’s meeting after church, so our evening seemed a little extra long. Finally, things wound down. American Idol was over. (My favorite is still Danny from last week! 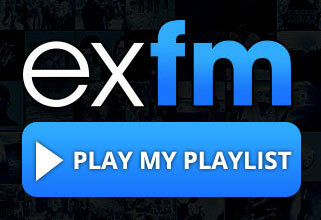 I’m hoping he ends up going “Christian-music” style! He’s a worship minister, and every time he sings I get goose bumps! ) Tim and I watched “Life on Mars”- a show we started watching with Nick last fall about a guy who was in a car wreck and somehow ended up 35 years in the past. I needed just a little quiet time before heading to bed. Animal sacrifices, awful sins, bizarre laws…. I need to make an appointment with one of the Bible professors at KCU where Tim teaches. I have sooooo many questions! After reading my day’s Bible text, I decided to dive into another chapter of this great book I’m reading called, A Grace Disguised. The author shares his journey through grief after losing his mom, wife, and a daughter all in a car accident. It is such a great book, and on so many levels I feel comforted by his journey. Thank you, Jerry Sittser, for sharing your story! Then for some reason I thought I might write a little that I learned from the book so I decided to open my blog. As I read a comment from two posts ago, I discovered that Beth Moore’s blog (which I have only visited once in my life several months ago) had a post about the academy awards too, so I decided to pop over and read it. Different perspective than mine…….but I enjoyed the words so much. Then it happened. I scrolled down to read the next entry and saw photographs of Beth Moore holding a tiny baby girl. I am a huge Beth Moore fan, and I did not know that she now had 2 grandchildren!!! But the part that really struck me was that this new little addition….Beth’s first granddaughter….is named Annabeth! It just about took my breath away, because I had never heard that name before we had our daughter Adrienne…. Her middle name was Annabeth (after my middle name “Ann” and my sweet little friend/sister “Beth” from my home church). So, I guess just reading the name “Annabeth” really affected me. I just loved Adrienne’s name so very much! Through all of these emotions that have been stirred in me tonight, I have been taken back to an experience I had while subbing today. See, there was a boy named “Nick” who played football with our Nick. He’s such a sweet boy. I had him as a student in 6th grade. Well, the night of Nick’s visitation just as the four-hour service was ending and the last of over a thousand people had walked through our church and shared the evening with us, the middle doors opened and this sweet Nick came walking towards me still in his basketball practice clothes. His mom said, “Nick was so afraid he was going to be too late.” With his hands wringing each other and his lip trembling, he hugged me and talked to me and my mom for a few minutes. I told him how much it meant for him to be there for me. Today, I had been in the same classroom for nearly an hour and a half when I decided to go downstairs and get some crackers for lunch. As I entered the hallway, I said “hi” to a girl student who was walking by. As I kept walking, I heard her say, “Mrs. Nischan,” and I looked back. She said, “Just a minute. Nick wants to say “hi.”” And sure enough at the other end of the hallway was this same sweet Nick! He came walking towards me and my eyes just lit up!! I hugged him and he said, “How are you doin?” I told him I was good. I said, “Taking one day at a time and trying to stay focused on the important stuff.” Then I pointed up. He said, “I love you,” and then he went his way and I went mine. But I have to say that that brief moment meant the world to me………….so much so that I texted my mom to share it with her. In my text I said, “In some ways, I can’t believe his name in Nick and in other ways I can’t imagine that his name could be anything else!” Mom replied, “It has to be Nick!” And I think she’s right. His name just has to be Nick. He is a little last minute gift from God! An earthly comforter for some reason. There’s power in a name. The Old Testament spends so much time sharing the meaning of people’s names, the changing of people’s names, the importance of people’s names. God loved names, and I believe He still does! I know the emotions that surge within me as a mom at the mention of my children’s names……. and I just have to believe that these emotions are multiplied to the greatest power imaginable by God when it says in the New Testament that…. at the NAME of Jesus every knee shall bow! WOW! Now that’s a powerful name! I think He wanted to remind me that in spite of my fatigue, my grief, and my ever-increasing list of questions concerning the Old Testament……. there is ABSOLUTE, UNDENIABLE POWER IN THE NAME OF JESUS CHRIST OUR LORD AND SAVIOR. Wow! What an ending to a very different kind of afternoon! I don’t have many words this afternoon. I’m just missing Nick, but oh, so happy that he is HOME with Adrienne!!! What a wonderful day they must be having!!!!!!!!!! Oh, thank you, Lord, for the hope of Heaven! What does God say about the word "impress?" Sunday night my son Evan and I watched the Academy Awards. I have to be honest. I have never in my life sat through the entire event. I’m not even sure if I have ever watched any portion of it “live” before in my life! But for some reason, Evan turned it on and since I knew he would be heading back to college the next morning, I decided to sit and watch it with him. Evan and I share a very similar sense of humor, so we got such a kick out of so many things that were happening during the night. From the movie star’s clothes to their comments to the way they held their heads….. Even the hosts were making us laugh. I know. We were probably not taking the whole event seriously enough. After all, the manner in which the stars received their little golden figurines and said, “thank you,” made me think that maybe they had just received a Nobel Peace Prize for discovering something that could make this world a better place for generations to come!! From a mere tv-watcher’s perspective, it sure seemed like “anybody” who is “anybody” should have been there. Walking with the right person. If you watched it, you know just what I’m talking about! The sad part is that before the program was even over, yahoo was already putting out headlines about mistakes, blunders, poorly-chosen dresses…….. Even the most “impressive” people of this world seem to fall short of “impressing” everyone. and my mind wandered to my memories of the Academy Awards and how hard those stars work to impress people who are so easily unimpressed. Then, of course, I had this urge to see what the Bible says about the word, “impress,” and guess what I found out. The word “impress” is ONLY in the NIV version of the Bible one time in its root form!!! And listen to how it is used! 7 Impress them on your children. Talk about them when you sit at home and when you walk along the road, when you lie down and when you get up. 8 Tie them as symbols on your hands and bind them on your foreheads. 9 Write them on the doorframes of your houses and on your gates. For some reason, I think God is making quite a statement by only using this word once and by using it the way He does. I think He is telling us that the only impressing we need to be doing while we’re here on this planet is the impressing of God’s commandments on children’s hearts. Kids are starving for people who care about them and who want to see them succeed in life. Have you noticed? We went to the district basketball tournament tonight and had such a good time. While I was there I was just amazed to watch people interact. Kids, young and old, are hungry for hugs, for kind words, for positive attention. And I believe that kids today are aching for the truth. So, as I head to the high school tomorrow, I’m definitely not expecting a red carpet entry! Not from man’s perspective, but from God’s. Not that He calls me to impress even Him……He just calls me and you to share His love with others. Trusting there’s enough…for one more squeeze! It probably started as a rebellion. ….until I threw it away! But that’s a whole other story…. This tube of toothpaste has begun to fascinate me, really. I still manage to squeeze out just enough to brush my teeth one more time…. Noone has complained yet about this tube’s lack of resources. It’s as if just enough toothpaste arrives to get us through another day! And the more I look at this tube, the more I realize that in many ways this is how you live when you’re grieving and really when you’re simply trying to live for Christ during a difficult time in your life. One “squeeze” at a time. Not really feeling stocked up on much of anything. Actually feeling fairly empty. As if life has literally been squeezed right out of you. 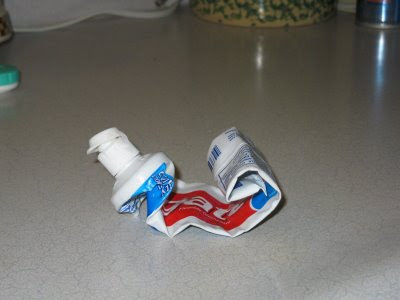 But then, somehow, God in His amazing wisdom knows the secret to making our empty tube of toothpaste somehow still have worth. Somehow still provide just enough strength to do what we need to do for one more day. There’s so many days when I would much rather pull the covers over my head and sleep my way through life. But, oh, I am so thankful for a Father who tells me that He can provide the strength I need for one more day!!! Eventually, I believe, that he will restore my “tube!” As if through a divine run to Wal-Mart, God will place a “new tube” of strength within me….and within Tim. But for now, I have to keep on allowing God to squeeze daily just enough strength from me to keep me going! And I’m trusting that He can and will. Because once again, I believe His Word is true! 10Each one should use whatever gift he has received to serve others, faithfully administering God’s grace in its various forms. 11If anyone speaks, he should do it as one speaking the very words of God. If anyone serves, he should do it with the strength God provides, so that in all things God may be praised through Jesus Christ. And in my grief, I can think of no one more worthy of praise than my Lord Jesus Christ!! After all, it is becuase of His death that I have hope and am confident that Nick and Adrienne are not dead! They are more alive than I could ever imagine! 12But if it is preached that Christ has been raised from the dead, how can some of you say that there is no resurrection of the dead? 13If there is no resurrection of the dead, then not even Christ has been raised. 14And if Christ has not been raised, our preaching is useless and so is your faith. 15More than that, we are then found to be false witnesses about God, for we have testified about God that he raised Christ from the dead. But he did not raise him if in fact the dead are not raised. 16For if the dead are not raised, then Christ has not been raised either. 17And if Christ has not been raised, your faith is futile; you are still in your sins. 18Then those also who have fallen asleep in Christ are lost. 19If only for this life we have hope in Christ, we are to be pitied more than all men. 20But Christ has indeed been raised from the dead, the firstfruits of those who have fallen asleep. with your feet fitted with the readiness that comes from the gospel of peace. 16In addition to all this, take up the shield of faith, with which you can extinguish all the flaming arrows of the evil one. 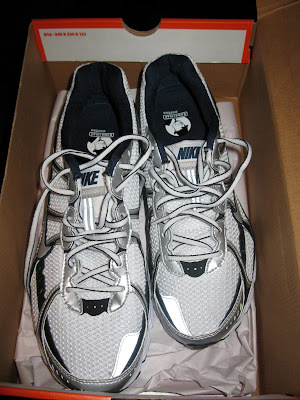 Tuesday of this past week, Todd and I made a quick trip after school to Huntington (the nearest town with a large sportings good store), because Todd needed a new tennis racket and shoes before tennis practice on Friday. Anyway, we headed back to our original starting point and very simply found just what Todd liked in the right size within minutes!!! I was so happy!!!! We paid for the shoes and head ed home. Several days passed by, and the shoes sat in their bag by the door. 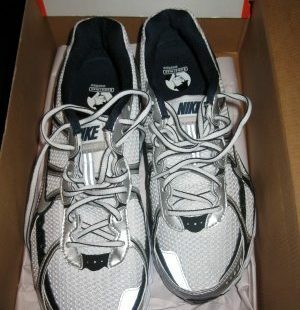 On Friday, Todd had tennis practice and pulled out the shoes to put them on. Immediately he discovered that although the box said 11 1/2, we had somehow gotten home with one shoe that was a size 9! I couldn’t believe it! How could we have been so careless!?! It was obvious to Todd as soon as he began to put on the size 9 shoe that it was not going to work. His first thought was that one of Olivia’s shoes had gotten into the box. He knew there was no way to make the shoe fit. Have you ever felt unprepared for what life has handed you? Have you ever felt uncomfortable with what you have said, how you have reacted, or how you feel about a situation? Have you ever realized that your walk doesn’t match your talk? Just like Todd trying to work with his mis-matched shoes, I sometimes try to make it with one foot in the world and one in the Word. But it’s not enough to have one shoe walking with God. One shoe “ready” with the gospel of peace. Not if the other shoe is the wrong size. The wrong words. The wrong behavior. The wrong message. The wrong emotions. Believe me. This shoe-shopping error was no accident. No, God had something to say to me. Just because the label says, “11 1/2,” or in my case, “Christian,” doesn’t guarantee that what’s on the inside always makes sense or is always right. No. I have to be sure ALL of me matches! I need to look deep inside and make sure BOTH of my feet are fitted with the readiness that comes from the Gospel of peace. And I need to look now……why? I can no longer allow my “spiritual fitness” to sit in a bag by the door until I am called upon to need it. When I do, then I am unprepared for the next practice or the next game. God calls us to be READY! And to be FITTED! But, one foot isn’t enough. He demands our all. Our everything. Our every action. Our every word. Our every thought. Anything less just doesn’t fit His plans. His purpose. His call. 28 Like the appearance of a rainbow in the clouds on a rainy day, so was the radiance around him. This was the appearance of the likeness of the glory of the LORD. When I saw it, I fell facedown, and I heard the voice of one speaking. Last summer a friend and I were given the opportunity to take Todd, Nick, and one of their best friends, Caleb, to the beach for a week. This trip was a gift from a man whom we never met….only spoke to on the phone. And it was as much a gift to my friend as it was to me and my boys. Just a time to slip away from everything that had been going on in both of our lives and sit on the beach and read, pray, talk, and watch the boys have fun. Finally, the sky became clear and the feeling of relief flooded our bodies…..especially mine…. with hands gripping tight to the steering wheel. It was gorgeous, and my friend began snapping pictures as we drove along. We passed several cars that had actually stopped along the interstate to do the same thing! In my heart I felt such warmth. I even felt that this could be a promise from God that if we could just keep pressing on in the “storm” of Nick’s cancer (which even on this trip we were heavily in the midst of with Nick being in back pain and his neurosurgeon encouraging us to “go ahead and enjoy the week at the beach”) that He would be there on the other side-full of promise and hope. Just like the double rainbow. Well, we had a wonderful week at the beach! We soaked up the sun, putt-putt golf, ice cream shops, fun restaurants, playing in the waves, reading on the shore, video games, everything we could think of! But, as you know, the worse was still ahead of us in Nick’s fight and little did we know that the very next week Nick would have his most devastating MRI up to that point and that from that moment on Nick would slowly get sicker and sicker. 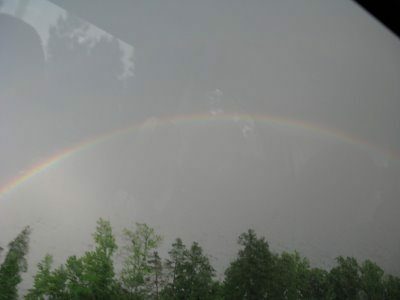 Seven months have passed since that double rainbow. Seven difficult months . A couple of weeks ago, I was driving Olivia to church for basketball practice and we were driving in a downpour coupled with heavy winds. This weather was following a terrible ice storm and lots of snow just a week or so before. As I got home and began doing some things around the house, my phone began to ring. First Roxy, then Brandon, then Martha, then someone else……..all telling me to look outside. Well, this week passed, and as you know if you have walked it with me, it has been everything for me spiritually…. I was home all alone. I closed my eyes and began to sing out loud some of my favorite worship songs. As I ended this time with God, I looked down at my cell phone and noticed a voice mail. I decided to listen to it just in case it was one of the kids and it was one of Olivia’s friends saying, “Tammy, look at the double rainbow.” I thought surely this hadn’t been on my phone all week as I had had lots of voice mails since then, so I called her mom to ask about it. She told me that “yes” in fact there had been a beautiful double rainbow that very afternoon. Noone had called me. Noone had told me. I asked several other people and sure enough it was a beautiful, beautiful double rainbow around the same time as the week before! I knew deep inside that for some reason God didn’t want me to know about it until the end of my praise time on that evening…..it was another message from Him to me and the timing had to be after the promise not during. 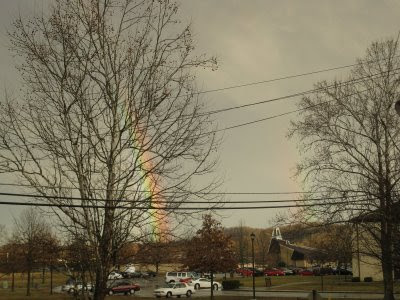 As I sat there thinking about what in the world the significance might be of these double rainbows coming just a week apart, I realized that the first one was on February 11th and the second one was 7 days after the first. Nick had given himself the nickname 7-11 when he was diagnosed with his second brain tumor after four years of no recurrences! That’s why his website is http://www.nick7-11.zoomshare.com/! What a day of promises!!!!!!!!!!!!!! Thankful for a God who speaks in ways I can hear! His Eye is on the Hummingbird…And I Know He Watches Me! After my dark period of questioning a couple of days ago followed by my reminder of the power of the resurrection, I have to share the events of Wednesday as they unfolded. In my quiet time, I was reading from the book Hope for a Hopeless Day. This is a great book, by the way, if you are looking for something new to read. The author is Jack W. Hayford. Anyway, in one chapter he shares the story of a family at his church who was facing the death of their baby who had a brain tumor. He tells of the morning when he received the call that their baby had died. It was very early when he left his house to meet the couple at the hospital and as he was driving he noticed something in the road and felt that he should stop to see what it was. He knew that this was no accident and that the manner and condition in which he found the bird was too unusual to not be a message from God that He held this family and their precious baby in His hands. Now, as I sat and read this in my quiet time, my heart was touched so deeply because a memory came to me from last fall that I had never shared with anyone. I don’t remember the month, but I know it was near a time when we had received news from the doctors that there was really nothing else they could do for Nick and we had been told to “enjoy every day with him.” It was during a time when walking by faith was absolutely all we could do. There was no earthly physician to help us…..the Great Physician was in total control. I was walking from our back yard to the front when I stepped on something. I didn’t look down. I really didn’t give it much thought. I just went on to the car to get whatever it was I getting. As I came back into the back yard, I looked down to see what it was and was horrified to see that a tiny, very newly hatched baby bird had fallen from a nest above and I had stepped on it. I cannot even put into words the emotions that I felt in that instance. How could I have been so careless? I was so sad. I didn’t mean to take that baby bird’s life. And then, suddenly, I felt peace and fear at the same time. I too was immediately drawn to remember that very same verse this author had talked about. I knew without a doubt in that instant that God loved Nick more than that baby bird that had fallen. At the same time, I felt fear because I knew that just as the baby bird had somehow fallen from his nest and his life had been taken accidentally by me that in this oh-so-terribly-imperfect-and-fallen world that things like this happen. Baby birds fall somtimes fall from their safe nests. God knows. And God cares. But it still happens. It was something I couldn’t share at the time it happened. One, because I still could not give up hope. Two, because I sure didn’t want anyone else to stop praying and give up hope. We had decided to package them with the top drawing being “The Cross.” At one point as Jennifer was wrapping a set, Nick’s drawing of a hummingbird “flew” from her hand and landed on the floor. After she tied the ribbon in place, she realized that she had forgotten to place the cross on top and had instead given the hummingbird that special place. We didn’t think a lot about it and chose to leave it the way it was. As we got near the end of packaging the sets and looked at the table full of crosses and the one hummingbird, I said, “His eye is on the sparrow.” And then it all came together in my heart! I even ran home to get my camera. It was such a special moment!! I began to share with my two friends about my quiet time and then shared my story from last fall for the very first time. We knew immediately that the hummingbird, one of 20 different drawings, had been selected by God to “fly” from Jennifer’s hand and then make its way to the top of the card set! We were amazed and left to go to our cars feeling so touched by God’s presence when the most amazing thing happened! I can’t help but believe that after my time of doubting and questioning just a few days ago followed by the reawakening in the power of the cross……. That God did not have His hand in every step of yesterday! Tomorrow I’ll share about the rainbow!!! Talk about feeling “let down.” Jesus, the very Son of God, was forsaken-deserted, abandoned, left alone. In a warm house by a cozy fire? No. On a beautiful beach with the waves lapping at his ankles? No. On a rough, splinter-filled cross being held in place simply by rugged nails that painfully pierced His hands and feet? Yes. Did He pray that this woudn’t happen? Yes! Did God hear His prayer? Yes! Did God love Jesus enough to save Him? Yes! And in that death, which the devil thought would end all hope for the people of the earth, God was able to perform the greatest miracle EVER! The resurrection of His Son, the final sacrifice for sin, the redemption of all mankind! It couldn’t have made sense to Mary. It didn’t make sense to the disciples. Jesus was dead. The Messiah was gone. I cannot even imagine the length of those three days as Jesus lay in the tomb. But, oh, to think of that resurrection morning! The joy that had to flow through everyone’s veins as they realized what had happened!!!!!!!!!!!! Jesus was alive!!!!! Forever!!!!!! And hope became hope like it never had before. And to think that with this knowledge rooted so deeply in my head I was able to allow one little statement to haunt me into a period of doubting. Can God let me down? It just amazes me how I can slip so easily. Stumble over a pebble, really. Falter in my faith when just a whisper of doubt rings in my ear. Honestly, when I sit and read that tonight and even think about someone saying, “God has never let me down,” I just cringe at the reality that I allowed myself to go there. Who would I even think I was to say, “God has never let me down,” as if He owes me anything or has some set of expectations that He has to meet in order to keep me feeling close to Him or deserving of my love. I guess when it comes right down to it, we all have this inner desire to see God as “the good news” God. I think of so many things I have heard and even said in the past when things have gone “my way.” You’ve probably heard them too. In and of themselves, I know these statements aren’t evil. But think about the power packed into the opposites of these very words……especially to the ears of someone struggling with a difficult time in their life. We need to be careful when we make these kinds of statements in celebration of something going our way. The truth is that even if things had not gone our way these statements would have still been true. NO MATTER WHAT WE’RE FACING…..
And for Adrienne, and Nick, and Tyler, and Brittany, and Kayla, and Garrett, and Natalie, and Andrea, and Cora and so, so many more……. Did God let me down? I have four more to go! Adrienne and Nick are where I want all my kids to find themselves when their time comes…..safely in the arms of God. So, for tonight, I guess I’ve had a reawakening. Thank you for all of your precious comments. I appreciated and loved them all! I have to be honest….I was truly nervous when I read them. So afraid of being scolded. Thank you for being kind! But if I believe in the very Words to which I have clung for most of my life, then I read this passage and in spite of my tears, I feel great peace and extreme joy. So I close by saying, “thank you.” I know that people were praying for me today, because I smiled and laughed my way through my first day of subbing back at the middle school with all of Nick’s friends. I hugged so many of his 8th grade buddies. I felt their love for Nick and for me. But even more than that, I felt God loving me through the day. Resting in the Power of the Resurrection!